Routines are one of the best tactics we busy moms can use to keep life from spiraling out of control. Today, I’m talking about one of my favorites: the nighttime routine. Prepping your home for the next day before you go to bed is a little present you leave for yourself to “open” the next morning. Your nighttime routine will look different depending on the stage of life that you are in. With a newborn in the house, for instance, much of the evening typically revolves around baby care and getting your child to sleep. 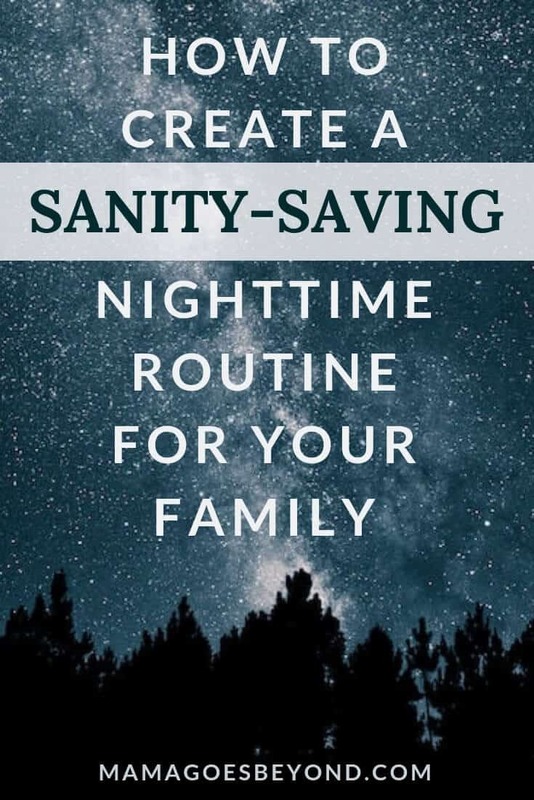 Ideally, as life slows down a bit, though, a great nighttime routine will involve four components: getting the house in order, knocking out some of tomorrow morning’s tasks, helping your kids get ready for bed, and spending a few minutes taking care of yourself. I’ll show you what this looks like in my house and then guide you through creating your own routine. We’re not going for perfection here. We often set a timer while we complete these tasks and run through them very quickly. The goal is to prevent the house from getting gross and to ensure that nobody steps on a Lego if they get up for a glass of water in the middle of the night. When my husband is home, we divide and conquer on this one. I typically put the boys to bed while he cleans up any dinner dishes. Also, I run the dishwasher every night, even when it isn’t 100% full. I know it isn’t the most frugal choice, but it means I never wonder if the dishes in the machine are dirty or clean, I rarely struggle to find a spot for a dirty dish, and my favorite coffee cup is always available. This just takes a minute or two and assures that we won’t have to worry about ants (or have crumbs on our feet when walking barefoot through the kitchen). If a job like doing the dishes is taking longer than I expected, I ask one of the boys to do this job with a hand broom and little dustpan. Nobody wants to wake up to a stinky trash can the next day. These days, we only have to worry about taking out the kitchen trash so we don’t have to smell those chicken scraps the next morning. In the old days, this meant we emptied the diaper pail most nights, too. My boys know that they don’t go to bed until they put away the toys they’ve used that day. I do a “5-minute pickup” of things around the house, too, so that I can wake up to a relatively clutter-free home the next morning. I have a washing machine with a timer. Every evening before bed, I prep a load and set the timer to run the load around 6 a.m. That way, when I get up, I have a load of clothes ready to transfer into the dryer. Doing a small load every day keeps laundry from becoming overwhelming and assures that even with minimalist wardrobes, our family members always have something clean to wear. I do the majority of my cooking for the week on the weekend, but I do like to do a quick check of our food situation at bedtime. I’ll also make sure anything the boys need for breakfast is off of the high shelves and onto their level so that they can make breakfast for themselves in the morning. As a work at home mom and a homeschooler, I don’t often have to leave the house early enough that I need to lay our clothes out the night before. I do a quick check at bedtime, though, to make sure we have what we need in the closet. Otherwise, the boys might be running in my room at 7 a.m. asking where their favorite sweatpants are. Ours has an automatic timer, so if I know what time we’re getting up, I’ll set it to be ready when I come downstairs. Otherwise, I’ll have everything ready to go with the press of one button. A side note of encouragement for those of you in the trenches—this job gets easier and easier as your kids get older. With infants, the night time routine sometimes takes hours—nursing the child to sleep while reading articles on your phone about whether or not you should do that and sneaking baby into his crib only to have him wake up to start bedtime all over again. Toddlers are little better. When my younger son switched to from a crib toddler bed, I once had to return him to it 97 times before he fell asleep that night.At 4 and 7, though, my boys don’t need quite as much from me. I start the bath or the shower if they need one that night (we don’t do this every day) and help with washing and rinsing hair. I check that the four-year-old has brushed his teeth properly and I help with flossing. I read a chapter from a book and play a meditation to calm the kids down. I stay in their shared bedroom for a few minutes so that they won’t talk too much and and stay awake. Sometimes I still get asked to sing a lullaby. This is one of those things I tend to neglect if I’m not careful. I am often really exhausted at bedtime and skip the extra few minutes I’d need to take care of myself. It helps to put systems in play here, too. I have all my vitamins in a daily pill box, for instance, so I can just grab a handful of them rather than opening all the little bottles. A complicated, multi-step skin regime is great, but not if all you’re willing to make time for is soap and some moisturizer. These two steps are the most I can muster at the moment. I try to do my personal care routine when the boys are getting their pajamas on. This assures that it is already done later in the evening when I might be tempted to skip it. The fact that I’ve already brushed and flossed my teeth also prevents me from snacking late at night. This can take many forms. Sometimes it’s a bath. Sometimes it’s taking a few minutes to work on something I’m passionate about. It could be snuggling with my husband or reading a book—writing in a journal or meditating. Often, I don’t have time or energy for much, but this simple, daily commitment to doing something just for me keeps me from feeling overwhelmed and resentful. So, there’s my routine. I encourage you to copy as much of it as would be useful to your family or to use these prompts to create your own. What aspect of an imperfect home grosses you out the most? Could you clean just that one thing tonight so that you wake up tomorrow feeling like a winner? What tasks could you do tonight to make getting out of bed tomorrow morning a little less daunting? Would it help to pack a bag, lay out some clothing, or prepare a lunch? Is there any aspect of your morning that results in regular frustration for you, arguments with your spouse, or whining from your kids? Could you improve the situation by tackling some aspect of it the night before? What aspects of your night time routine could you delegate to other members of your family? Have you been neglecting parts of your personal care routine? What is a simple process that you could definitely stick to every night? Would it help to try to accomplish these tasks earlier in the evening? What’s something that leaves you feeling particularly relaxed and clear-headed that might be nice to do before bed? 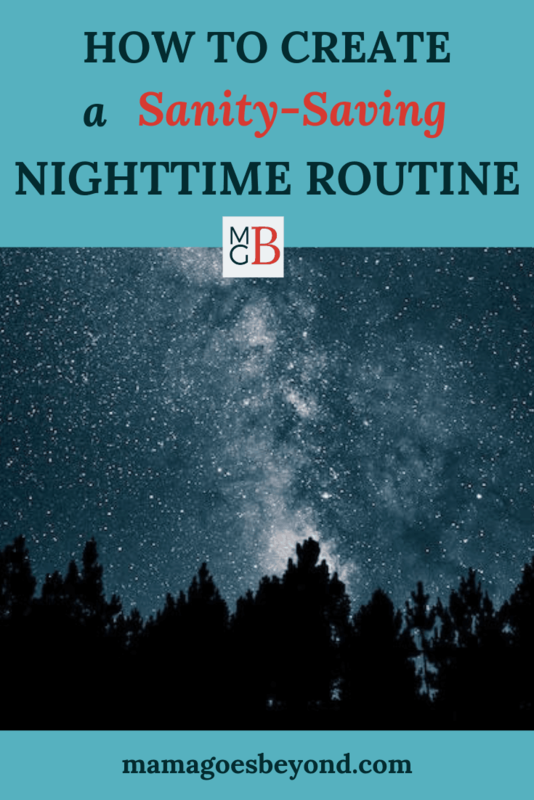 After answering these questions, you probably have a really nice framework for setting up your own nighttime routine. Sketch it out, try to implement it for a week or so, and make tweaks as necessary. Remember, this is a living document and should change as your kids grow, your priorities shift, and you discover new things that work better. Are you ready to create your nighttime routine, or do you already have an evening routine that makes your life easier? what a great list. I LOVE the idea of doing a little bit of laundry every day. my problem is just putting it away. I feel like if i had a one-story house it would be easier? It’s funny, when my husband is away for work i actually have a better routine. we just get lazy, but then that laziness grows into frustration after too long. I’m going to work on implementing some of these! I know. Putting it away is definitely the worst part. That’s actually why I implemented this policy. I’d do 5 loads of clothes on Saturday, and it was so overwhelming to put in all away at once, that I’d end up with a huge pile which sat all week getting all wrinkly on the bed in the spare bedroom. (And I don’t even have your excuse.) My washer is located less than ten steps from the two bedrooms where the laundry needs to be put away. So glad the post was helpful!!! I am all about prep. Do as much as you before you have to do it makes the next day much smoother. I hate doing laundry, but especially putting it away. I never want to get around to doing it! LOL 🙂 You’re not alone. Omg I feel like I could have written this myself. As a naturally disorganized procrastinator, I had to break 30 years of bad habits real fast. I love this article because it’s pretty much my routine and I can say from personal experience… yes it really does save your sanity! So glad to hear that you’ve been able to find a routine that works for you, too!